An avulsion fracture is where a fragment of bone is pulled away at the ligamentous or tendinous attachment. It can be caused by a traumatic traction (repetitive long-term or a single high impact traumatic traction) of the ligament or tendon.This occurs as tendons can bear more load than the bone. 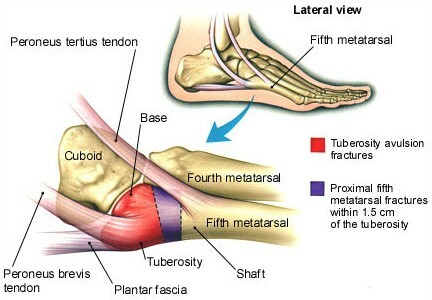 It can occur at numerous sites in the body, but some areas are more sensitive to these types of fractures than others, such as at the ankle which mostly occur at the lateral aspect of medial malleolus or in the foot where avulsion fractures are commonly at the base of the fifth metatarsal, but also at the talus and calcaneus. A twisting injury to the ankle and foot may cause an avulsion fracture at any of these locations. The characteristics of an avulsion fracture differ from those of a ligament rupture. Unlike non-operative treatment of a lateral ligament rupture, non-operative treatment of avulsion fractures do not yield satisfactory results. Symptoms of an ankle avulsion fracture are very similar to an ankle sprain and it is very difficult to diiferentiate without an X-ray or an MRI scan. A Jones fracture occurs as a result of a stress fracture to the 5th metatarsal, due to repetitive loading of the outside part of the foot from the patient’s underlying foot pattern or lower extremity alignment. Unlike a Dancer’s fracture a Jones fracture may not heal and often requires surgery. A history of the injury is taken, such as mechanism, immediate pain levels and swelling. The Ottawa Ankle Rules can be used to localise the exact area of pain. Palpation may also be useful. An inappropriately managed avulsion fractures can lead to significant, long-term functional disability. Most fractures heal well, but following a strict immobilisation period normal arthrokinematics, strength of the lower extremity muscles, proprioception and functional movement for chosen sport/activities need to be regained. Acute phase: can begin at 2 weeks post-operatively. This phase can include passive range of motion exercises and crytherapy and is based on the reduction of pain, inflammation and oedema, while keeping muscle atrophy of the lower limb to a minimum. Recovery phase: begins once the goals of the acute phase have been met. Weeks 0-6: active ROM exercises for the toes and the MPT joints, strengthening exercises for the ankle and foot are still premature however. In week 2, isometric exercises for the dorsiflexors, plantarflexors, invertors and evertors of the foot, along with active ankle ROM movements can be started. Weeks 6-8: active and passive ROM exercises for the ankle and the subtalar joint with Isometric and isotonic exercises. Exercises for proprioception and proximal strength and control.